Riding in the middle of unspoiled nature. You can participate in an unforgettable ride on the sand just where the Mediterranean waves break. Or climb the flowered hills, always in sight of the sea. Outdoor activities in this part of Sardinia can be practiced with ease and simplicity. There are numerous small associations to organize trekking, hiking and biking. Water sports and fishing are offered along the harbor. Riding schools and horse trekking are exercised by some equestrian centers. Do not let yourself get lazy, do not always stay in the garden of your house or your apartment, do not spend all day sunbathing on the beach. Enjoy all the opportunities for outdoor activities that Sardinia offers: hiking, trekking, biking, fishing, scuba diving and snorkeling! 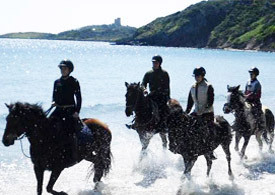 And riding on hills and beaches of Southern Sardinia is an unforgettable experience. In Sardinia there are some wonderful opportunities for lovers of horseback trekking in Sulcis, Carbonia Iglesias, Porto Pino, Sant'Antioco, Buggerru, along the coast of the South West of Sardinia. 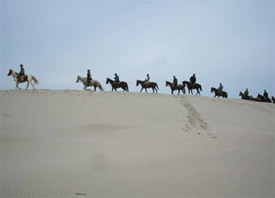 Some riding schools organize periodic treks on horseback: a group of horse riders, led by an experienced guide, will travel paths from a mountainous area, then go down to the sea. And there you can ride along the beach, in the periods and times when the beaches are not crowded by swimmers. You must report to the riding school you want and book your participation. You will find several flyers of equestrian centers, close enough to the villa or apartment that you rented for your holidays. Maneggio Sulcis, Horse riding school. 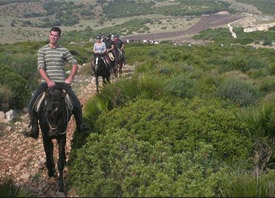 Horse trekking and excursions around the Sulcis, one of the most beautiful areas of Sardinia. We invite you to visit our website to see the paths, for any degree of experience. We also have a VAN to transport the horses. We wait for you. It is in the heart of Sant’Antioco island near the beach of Coequaddus and not far from Cala Sapone, in a location convenient for those who rent a villa or apartment from those advertised on our site. It's a riding school, and often organizes horse riding over the hills and beaches of Sant’Antioco.